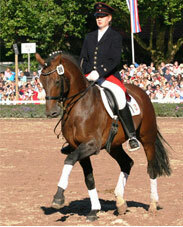 Ehrentanz, bay Westphalian Stallion, by (Ehrentusch / Fruhlingsrausch) born in 1990, standing approximately 16.2 hands. Ehrentanz I completed his stallion performance test in Warendorf in 1993 in the leading group with high scores in the rideability index. After that he had wins and high placings in test at Prix St. Georges and intermediate I level. 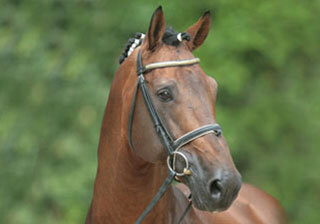 174 of his off-spring are registered as sport horses (e.g. Ephedra/Eva Maria Sprehe; Enzian/Mette Assouline/DEM; Excaliber of Avaion). Ehrentanz I sired 3 licensed stallions (e.g. Ehrenstolz) and 10 state premium mares. Many of his off-spring became auction highlights. 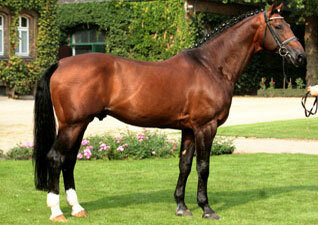 His sire Ehrentusch is one of the popular stallions of the recent breeding history.